Seaspray on deck during the stacking after the sail change onboard Groupama Sailing Team during leg 5 of the Volvo Ocean Race 2011-12, from Auckland, New Zealand to Itajai, Brazil. Team Sanya sustained rudder and hull damage near New Zealand, so while the five other vessels are slicing through the waves of the world en route to Brazil, its boat is being shipped to Savannah, Ga. It will rejoin the race at the start of Leg 7 — from Miami to Lisbon, Portugal — and miss Leg 6 from Itajai to Miami because it could not be shipped to Brazil in time for the in-port race there. The teams, which feature Olympic gold medalists and America’s Cup winners, earn points during each leg and the races that take place at each of the nine ports along the route. The race’s first sole Chinese entry will take the opportunity to sail from Savannah to Miami and test the repairs before rejoining the fleet for the Miami In-Port Race on May 19 and the start of Leg 7 on May 20. It was Sanya’s third big setback in the race. Shortly after leaving Alicante, Spain, in Leg 1, major bow damage meant it had to be shipped to Cape Town, where the leg ended. Then, while leading Leg 2, a piece of rigging broke, forcing it to Madagascar for repairs. "For sure we are absolutely gutted to find ourselves for the third time in a devastating position. … We are as focused as ever to get back into the race and make our sponsors and fans proud,” said Team Sanya CEO and skipper Mike Sanderson, who along with his crew fought water pouring into the aft compartment that laid the boat almost flat in the most recent incident. Miami is the cruise capital of the world, with sun, fun and nonstop feasting on most nautical vacationers’ minds. But in May, Biscayne Bay will be a far less serene setting as state-of-the-art racing yachts are pushed to their limits by fearless adventurers of the most extreme variety. They battle brutal weather conditions and fatigue, deal with the threat of pirates and eat nothing but liquid and powder and freeze-dried substances — and all in the name of competition. 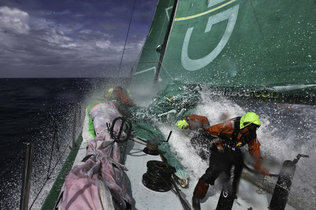 It is the Volvo Ocean Race, a 39,000-nautical-mile, nine-month boxing match with the angriest seas around the world. After navigating more than halfway around the world and touching six ports on four continents, a fleet bruising its way to the finish of the world’s most challenging race makes its only North American stop in Miami following its arrival in Itajai, Brazil, in the coming days. Team Telefónica rounded Cape Horn — notoriously hazardous while ships carried trade around the world before the Panama Canal was built, and it remains a monumental achievement in the sailing culture — on Saturday and then suspended racing for 12 hours to make repairs in a cove in Hershel Island in Cabo de Hornos National Park. The inspiration felt by the sailors in passing Cape Horn could be similar to the feeling they get while competing in Miami, a city rich in maritime tradition. Fans can get a close-up look at the grit and determination it takes to compete in this grueling race during the Miami In-Port Race offshore of the Downtown Miami Race Village at Bicentennial Park (1075 Biscayne Blvd.). From May 6 to May 20, the fleet will be parked at the village, which will feature interactive pavilions, several sailing and extreme water sports activities, youth sailing regattas, a pro-am race and more. If you’re lucky, you could run into one of the competitors — they surely will be happy to see land and people other than the crewmates they already are all too familiar with after being in tight quarters since this odyssey began Oct. 29. After Miami, the fleet heads to Lisbon, then Lorient, France; and then to the finish line in Galway, Ireland, in early July.